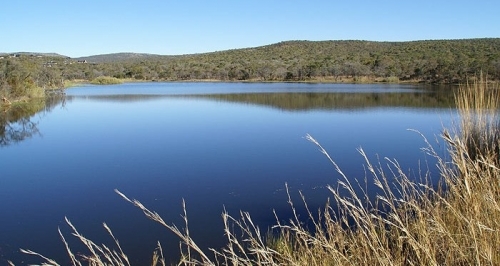 Monate Private Game Reserve, is an enclosed natural area of approximately 3220 hectares on the farm Weynek 505 KQ, situated adjacent to the town of Rooiberg, Limpopo Province. The reserve can be broadly classified into the savanna biome of South Africa. Savannas are characterized by a well-developed grassy layer and a distinct upper layer of scattered to dense shrubs and trees. The conservation status of savannas in South Africa is generally good (van Rooyen, 2002). They make up 35% of South Africa’s land area, and are the basis of two major industries: cattle ranching and wildlife-related tourism (Scholes & Walker, 1993). Monate has for the past 10 years been privately owned by a group of approximately 40 shareholders. The shareholders utilize the reserve for low density residential, conservation and recreational purposes only. Prior to that, the reserve was actively part of the historical tin mining in the Rooiberg area. Tin mining in the area is said to have lasted for 800 years in the Rooiberg area, ceasing in 1993 (Rozendaal et al, 1995). Many old shafts still exist on the reserve today. These shafts host a number of faunal species including bats. Cattle ranching also forms part of the farm Weynek’s history. There is evidence of wood fenced cattle kraals and large stands of bare ground due to historical overgrazing. The remnants of stone walls also exist on the reserve, possibly associated with the tin mining history.